A new version of the Snow Melt Onset Over Arctic Sea Ice from SMMR and SSM/I-SSMIS Brightness Temperatures is now available. From this data set, a statistical summary of melt onset (MO) dates on Arctic sea ice is presented. Significant trends indicate that MO is occurring 6.6days/decade earlier in the year for the Arctic while regional trends in MO are as great as 11.8days/decade earlier in the East Siberian Sea. The Bering Sea is an outlier where MO is occurring 3.1days/decade later. 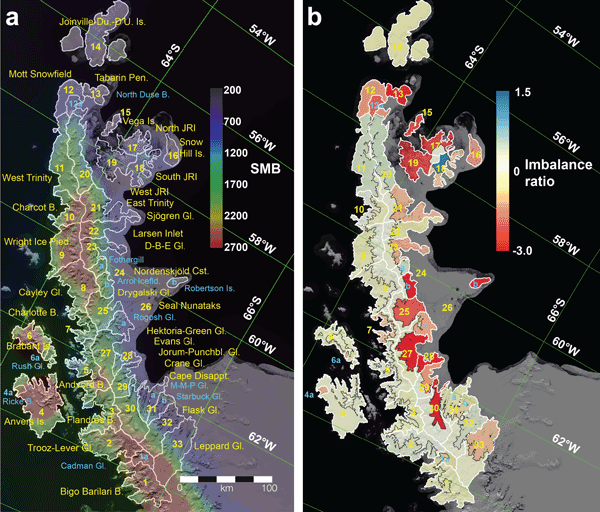 This study of one of the most rapidly changing glacier regions on earth -- the Antarctic Peninsula -- uses two types of satellite data to measure the rates of ice loss in detail for the individual glaciers. The satellite data is laser altimetry from ICESat and stereo image DEM differences. The results show that 24..9 ± 7.8 billion tons of ice are lost from the region north of 66°S on the peninsula each year. The majority of the data cover 2003-2008. This paper presents point-scale surface energy balance on Chhota Shigri Glacier, Western Himalaya, India. Energy is available for melting only in summer-monsoon. Net all-wave radiation is the main heat flux towards the glacier surface accounting for 80% of the total melting energy followed by sensible (13%), latent (5%) turbulent and conductive (2%) heat fluxes. The intensity of summer-monsoon snowfalls is found among the most important drivers controlling the mass balance of this glacier. A post-LIA multitemporal glacier inventory along a latitudinal transect in the Central Italian Alps shows that average annual decrease (AAD) in glacier area has risen by about ten times from 1860--1990 to 1990--2007. When considering glaciers smaller than 0.5 km2, post-1990 AAD follows the latitudinal gradient with maritime-like Orobie glaciers shrinking much less than Disgrazia and Livigno glaciers. We argue that the recent resilience of glaciers in Orobie is due to local climatic decoupling. We evaluate the potential of Pléiades sub-meter satellite stereo imagery to derive digital elevation models (DEMs) of glaciers and their elevation changes. The vertical precision of the DEMs is ±1 m, even ±0.5m on the flat glacier tongues. Similar precision levels are obtained in accumulation areas. Comparison of a Pléiades DEM with a SPOT5 DEM reveals the strongly negative region-wide mass balances of glaciers in the Mont Blanc area (-1.04±0.23m at 1 water equivalent) during 2003-2012. Existing methods (area–volume relations, a slope-dependent volume estimation method, and two ice-thickness distribution models) are used to estimate the ice reserves stored in Himalayan–Karakoram glaciers. Resulting volumes range from 2955–4737km³. Results from the ice-thickness distribution models agree well with local measurements; volume estimates from area-related relations exceed the estimates from the other approaches. Evidence on the effect of the selected method on results is provided. We present a temporal inversion of surface mass balance and basal friction for the Northeast Greenland Ice Sheet between 2003 and 2009, using the altimetry record from ICESat. The inversion relies on automatic differentiation of ISSM and demonstrates the feasibility of assimilating altimetry records into reconstructions of the Greenland Ice Sheet. The boundary conditions provide a snapshot of the state of the ice for this period and can be used for further process studies. The paper investigates changes in the area of 498 glaciers in the main Caucasus ridge and on Mt. Elbrus (the highest summit in geographical Europe), Russia/Georgia in the late 20th and 21st centuries using ASTER and Landsat imagery with 15 m resolution from 1999-2001 and 2010-2012 and aerial photography from 1987-2001. The glacier area decreased by 4.7±2.1% or 19.2±8.7 km2 from 1999-2001 to 2010/12. The recession rates of glacier terminus more than doubled between 1987-2000/01 and 2000/01–2010. Elevation dependencies of snow depth are analysed based on snow depth maps obtained from airborne remote sensing. Elevation gradients are characterised by a specific shape: an increase of snow depth with elevation is followed by a distinct peak at a certain level and a decrease in the highest elevations. We attribute this shape to an increase of precipitation with altitude, which is modified by topographical-induced redistribution processes of the snow on the ground (wind, gravitation). Temporal evolution of pCO2 profiles in sea ice in the Bellingshausen Sea, Antarctica (Oct. 2007), shows that physical and thermodynamic processes control the CO2 system in the ice. We show that each cooling/warming event was associated with an increase/decrease in the brine salinity, TA, TCO2, and in situ brine and bulk ice pCO2. Thicker snow covers reduced the amplitude of these changes. Both brine and bulk ice pCO2 were undersaturated, causing the sea ice to act as a sink for atmospheric CO2. The Baltic Sea is a seasonally ice-covered marginal sea in central northern Europe. In wintertime, on-time shipping depends crucially on sea ice forecasts. Among the forecasting tools heavily applied are numerical models, which suffer from a lack of calibration data because relevant ice properties are difficult (and costly) to monitor. We developed an innovative and inexpensive approach, by using ship speed observations obtained by the automatic identification system (AIS) to asses such models.